KeyInstant Blog - HOW TO USE LETITBIT / SHAREFLARE / VIP-FILE PREMIUM KEY ? HOW TO USE LETITBIT / SHAREFLARE / VIP-FILE PREMIUM KEY ? I. You can use the password without registration. You will have to enter the password each time you download a file. You do not need to do anything else to use this method. II. You can register an account at Letitbit.net / Shareflare.net / Vip-file.com and link your password to your account. This option also allows you to download files from torrents using Letitbit.net / Shareflare.net / Vip-file.com. The instructions below explain how to do it. 1. LOGIN to your account or REGISTER to create a new one, then LOGIN. 3. Find an active link for the file you want to download and paste it into your browser. 4. 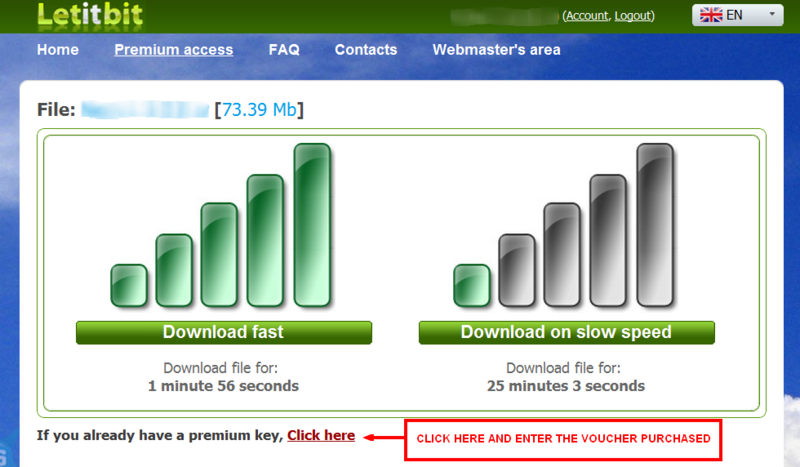 Below the "DOWNLOAD FAST" picture you will see "If you already have a premium key, Click here". Click and enter the password purchased from us.